Back in March, the ML team ate our way through the entire Grand Central’s Oyster Bar Menu. 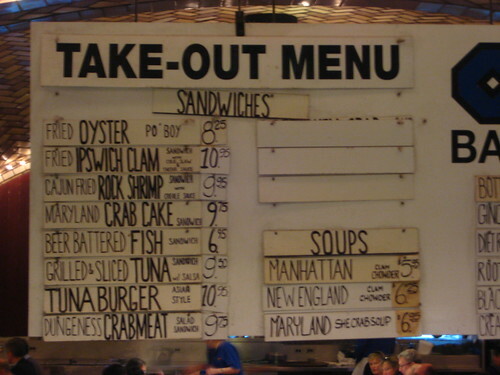 Well, almost the entire menu…the Oyster Bar offers three soups per day and two of those slots are typically taken by their classic New England and Manhattan Clam Chowders. The third slot is the wild card. We tried their excellent Tuscan White Bean Soup and I’ve had their Lobster Gazpacho, but I’ve never had their famous Maryland She-Crab Soup… until now. If you sift through the ML Oyster Bar archives, you’ll see that the She Crab soup is somewhat of a fan favorite among the commenters. Having spent more summers up North than down South, until I ordered the She Crab soup myself, I had no idea what to expect or even what it was. So for the uninitiated, here’s what you get. 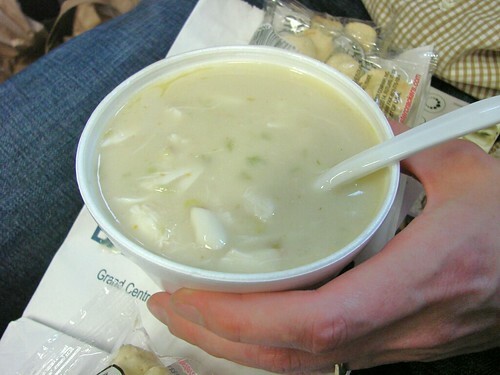 The soup itself is creamy, but not overly so, and it was chock full of crab. Of the Oyster Bar soups that I’ve tried this one definitely had the most seafood. I was not expecting that many hearty chunks of crab. And I’m curious if She Crab soup vets can weigh in and let the rest of us know if the soup is generally this loaded or if I just got lucky because I was there later in the day. In any case, my serving was filling, satisfying and a solid deal at $6.95 for the quality and the amount of seafood. This is definitely a soup I’ll be back for again. 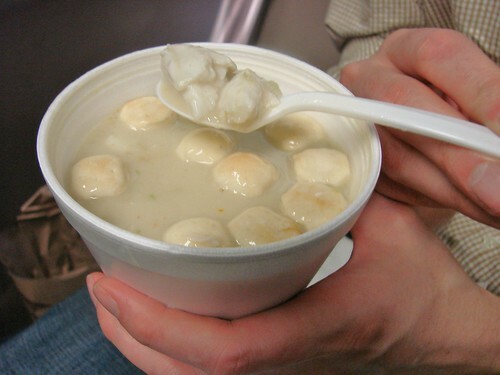 Posted by Brownie at 9:00 am, May 19th, 2010 under Grand Central Oyster Bar, Soups. Cool. Nice creamy soup. It could use some hard bread to soak up on. Crusty bread would have definitely been welcome. Fortunately they are at least pretty liberal with their oyster cracker distribution. Was there any crab roe in there? The versions I’ve had have a slight redness from the roe. Crab roe? Hmmm…I didn’t notice any redness in my soup at the time or the little roe bits. But maybe it was incorporated into the stock. Looking back on my photos, it looks pretty standard cream colored. It’s called She-Crab soup because it includes not only crab meat, but also the roe from the female crab. It gives it a more seafood flava. Otherwise, it would be just normal crab chowder, right? I could be wrong. That makes perfect sense in terms of the lady crab-ness. I wonder if mine was just low on the roe. Definitely didn’t notice it texturally. SHAME on you all!!! Blue crabs are becoming less abundant and the capture of female crabs only worsens the problem. A female crab represents thousands of additional crabs.